"If you feel you want to get a decent grasp of free–market economics . . . this book is the perfect place to start." "How an Economy Grows and Why It Crashes makes economics fun and accessible. 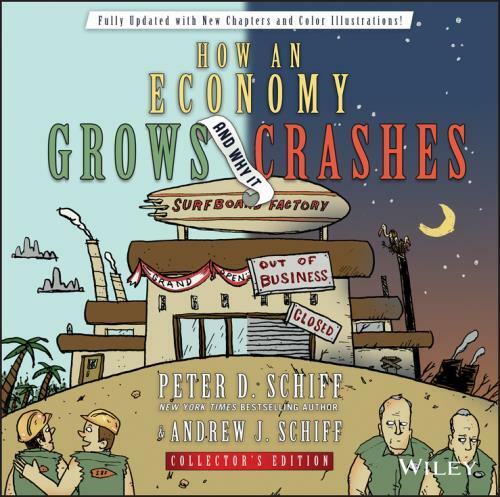 Bestselling author and 2010 U.S. Senate candidate Peter D. Schiff and his brother Andrew J. Schiff, communications director of Euro Pacific Capital, convey the often intuitive ideas of economics through an engaging, fictitious story richly illustrated with amusing cartoons." At last, straight answers to some of economics′ more vexing questions. With the help of colorful cartoon illustrations, lively humor, and deceptively simple storytelling, brothers Peter and Andrew Schiff bring the complexity of economics down to earth for all to understand. Along the way, the brothers apply their signature take–no–prisoners logic to expose the glaring fallacies and gaping holes that permeate the global economic conversation. The book is designed so that all people, even teenagers, can gain a better grasp of what turns the economic wheels of progress and what makes them stop turning. While the story may appear simple on the surface, as told by the Schiff brothers, it will leave you with a deep understanding of How an Economy Grows and Why It Crashes.